Rob Randels and his team believe in continually striving toward excellence in all personal and professional pursuits, and particularly in the service of clients who are making some of the most important decisions of their lives. 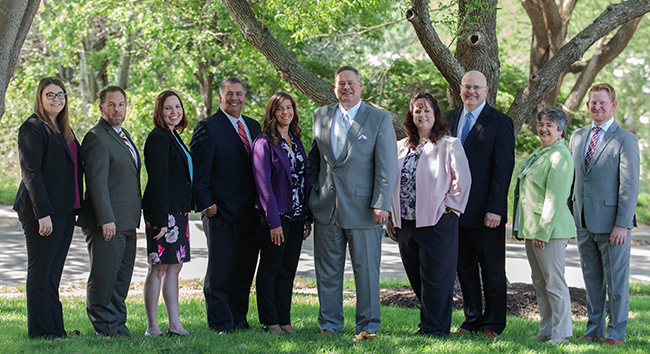 Together they have over 120+ years of experience and are dedicated to helping each and every client achieve financial security. They work to foster a culture that shares their philosophy and practices it daily. Anything less would be a compromise. Please call whenever you have a question, concern or need. Rob Rob and his team are eager to help. Tim, an Omaha native, began his 25+ year financial industry career with 7 years at the Federal Reserve Bank in St. Louis. Tim then worked in commercial banking and consulting before an 8 year role with a financial software company that developed treasury management applications. The past 11 years he has been a Financial Representative working with both individuals and businesses delivering meaningful financial solutions. He holds his Life and Health, Series 6, 7 & 63 licenses. Tim has a BSBA from Washington University in St. Louis (Olin School of Business). He loves to spend time with his wife Margie and his three children (Elizabeth and twins John & Tim). Margie is his jogging partner and he also likes to play basketball and cook. Over the past 18 years, Bob has been providing financial services for individuals, families and businesses. He helps clients simplify the complex financial objectives of their lives. He helps by identifying, achieving and managing financial security through the use of a goals based approach to money and risk management which is the foundation of his philosophy. He attended the University of Nebraska and holds his Life and Health, Series 7 & 66 licenses. Bob is a native of Grand Island, Nebraska and is the proud father of three children. He enjoys getting outside to ride his bicycle, watching the kids compete and donating his time with Red Cross and American Cancer Society. Carla is a Bellevue University graduate majoring in Finance and has her MSFS (Masters of Science in Financial Services) from The American College in Bryn Mawr, PA. She is fully licensed for both securities and insurance transactions with over 18 years of industry experience. She holds her Life and Health, Series 7, 9, 10, 63, 65 & 66 licenses. Carla enjoys reading, volunteering for the Northern Plains Boxer Rescue, competing in Mud Runs and singing in her church choir. She also loves to go scuba diving with her husband, Tim, and their two sons, Evan and Jake. Katie began her career in the financial services industry 12 years ago, after spending the prior 15 years in finance management and accounting. She is an Omaha native with a Bachelor of Science degree in Healthcare Management from Bellevue University. Katie holds her Life and Health, Series 7 & 63 licenses. Katie joined our team in the fall of 2016 with her focus on investments and retirement plans. Katie was recently awarded the Retirement Income Certified Professional Designation (RICP®). In her free time, Katie enjoys traveling with her husband, Mike, and spending time with their six children and six grandchildren. She also enjoys reading and going to movies. Jeff was born in Orange City, Iowa but grew up in Omaha. While earning his Bachelor’s in Banking and Finance at the University of Nebraska at Omaha, he joined Northwestern Mutual as an intern. He then continued his education, and, upon earning a MBA from the University of Nebraska at Omaha, he took a consulting job in Tokyo. After 6 years in Japan, he returned to the Omaha area and bought a food distribution company. After building it up for 5 years he sold it to a larger competitor and rejoined our Northwestern Mutual team. Jeff is happy to assist you with insurance questions, as well as assisting in the development of both personal and business planning analysis to serve our clientele. In his free-time, Jeff enjoys playing indoor soccer, Legos and going to the movies. Cherie joined our team with over 9 years of experience in the Financial Services industry with a focus on Customer Service . She currently holds her Life and Health Insurance License, Series 7, Series 63 and is an Associate Wealth Management Advisor and Insurance Specialist. She grew up in Sioux City, IA and made her way to Omaha, where she has resided with her family for the past 17 years. In her free time, she enjoys yoga, time with family, reading, attending her daughter's show choir competitions and every Sunday, during football season, cheering on and watching the Carolina Panthers! Claire's role is Director of Technology and Special Projects. She is responsible for onboarding new associates on the team, working in conjunction with our Network Office Technology team to keep us on track to be a Digitally Savvy Advisor and directing special client and prospect segmentation projects. Claire is an Omaha native and has been a part of our team since November 2017. She has earned a Bachelor of Arts in Mathematics from Northwestern College in Orange City, Iowa and an Associate's Degree in Computer Programming from Metro Community College. In her free time, she likes spending time with her friends and family. She also enjoys going to the movies and reading. With over 10 years of experience in the Financial Services industry, Jamie will continue to use her knowledge and talents to enhance the customer experience as an Associate Financial Representative. Jamie holds her Series 6, Series 63 and Life and Health Insurance Licenses. She also serves as the Director of Marketing for the team where she plans and organizes marketing and appreciation events for clients, team outings and maintains social media presence while promoting the team brand. Jamie resides in Omaha with her husband Matt and two children, Gabby and Cooper. Her outside interests include travel, Nebraska football and spending time with family. Her favorite quote is "I’ve learned that people will forget what you said, people will forget what you did, but people will never forget how you made them feel."